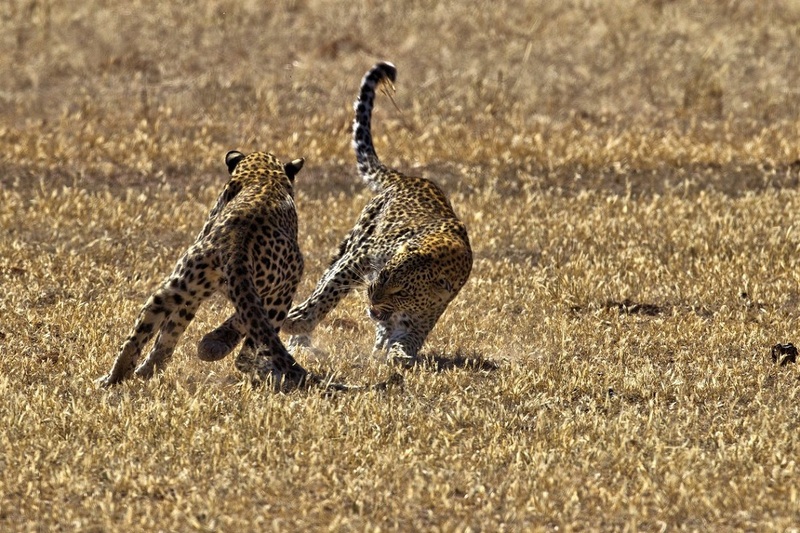 The Kgalagadi Transfrontier Park is especially known for its incredible wildlife encounters – from epic kills to captivating animal interactions. 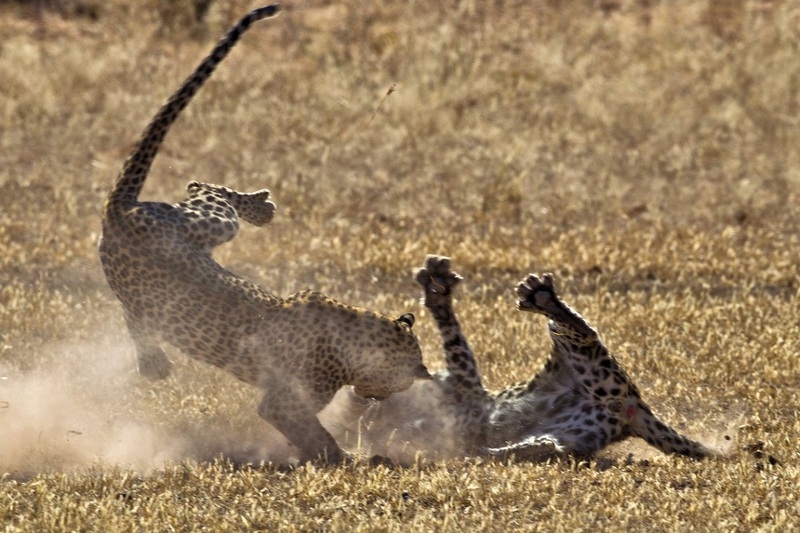 But what photographer Fanie Heymans encountered was truly breathtaking… Feast your eyes on one ferocious leopard brawl. 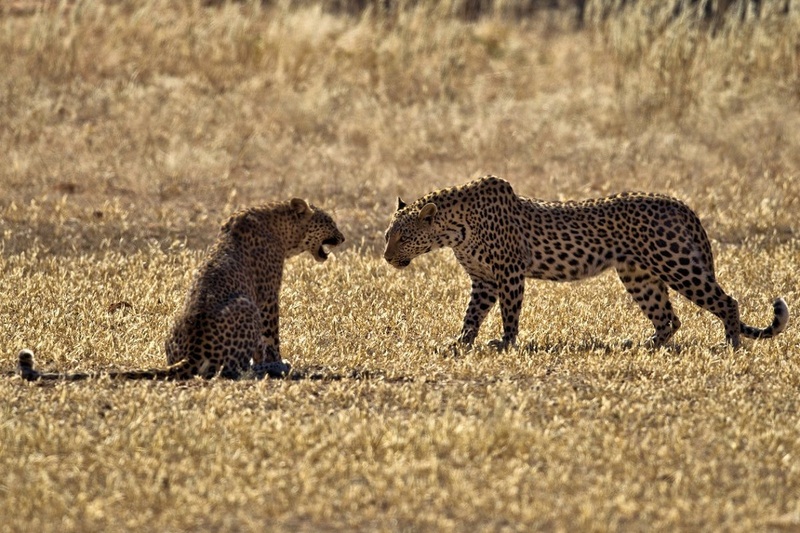 “We were driving along the Auob River when we saw a leopard walking towards Mata-Mata. It passed a few blue wildebeest and did not show any interest at all. 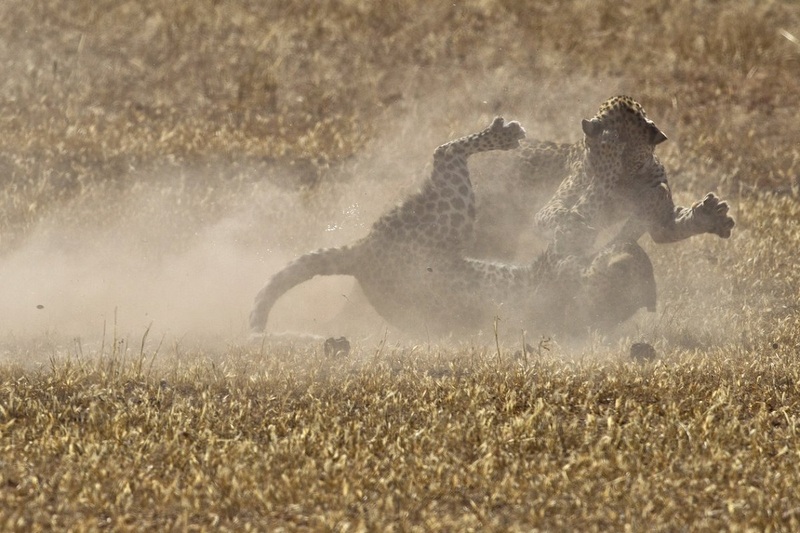 We thought it strange – there went our opportunity of photographing a kill that day. 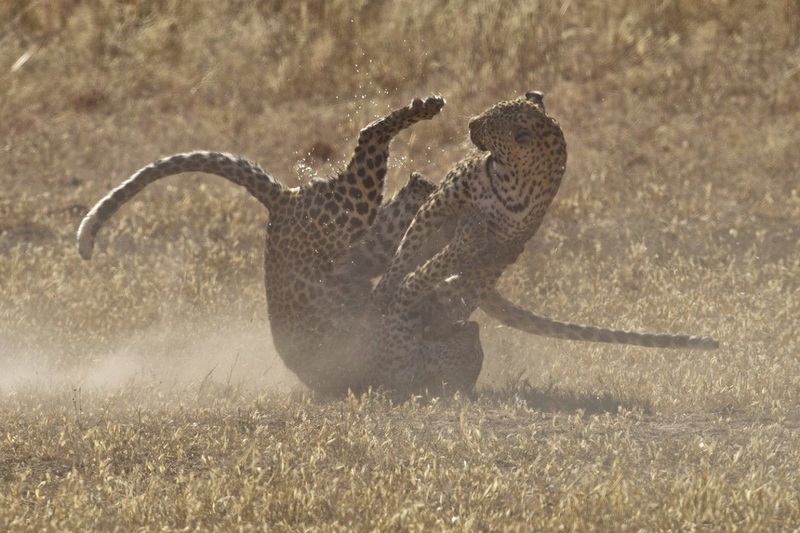 A few hundred metres further the leopard suddenly stopped and we spotted a second one. 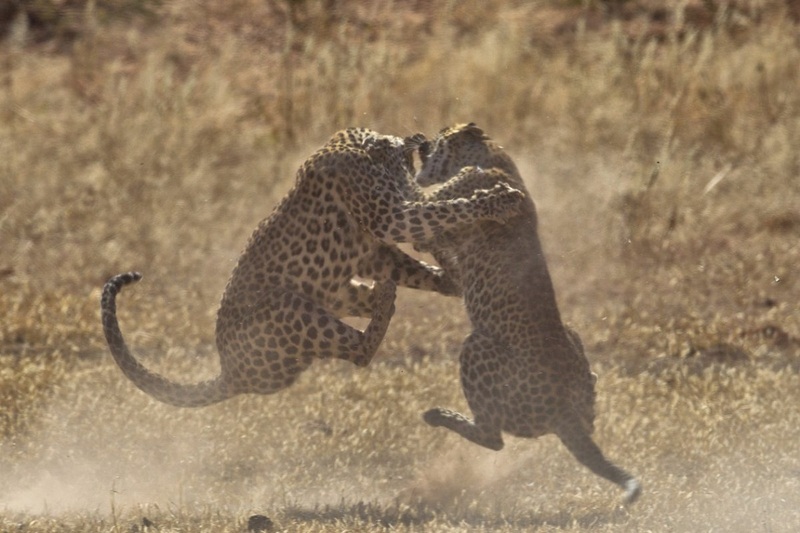 The leopards were approaching one another, moving away from the rocky riverbank and straight in our direction. “Within seconds all hell broke loose. All we could hear was these strange growling noises and dust filled the air. 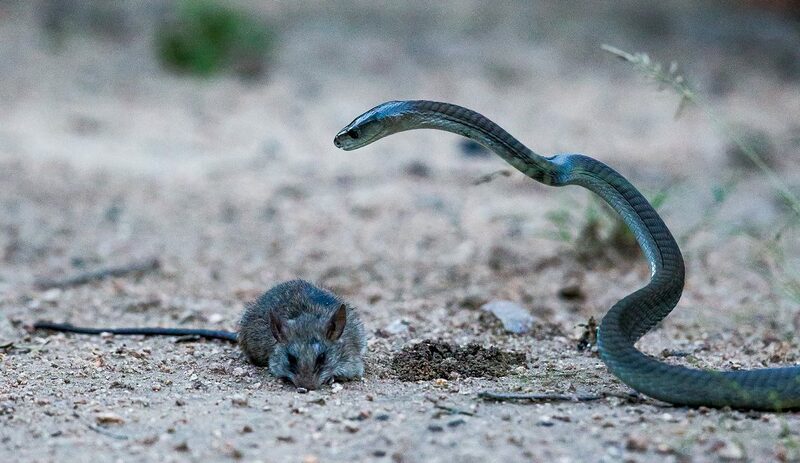 The moment was both exciting and scary. The earth was literally trembling underneath our vehicle. 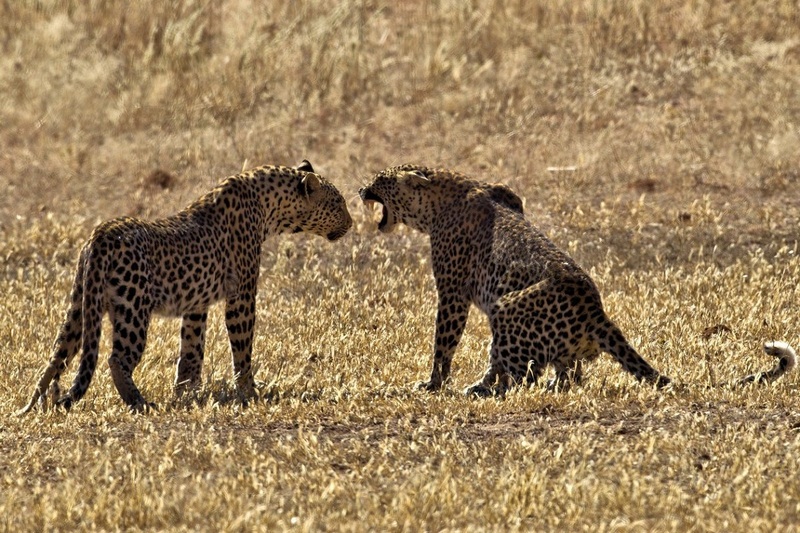 It seemed like a fight for territory. 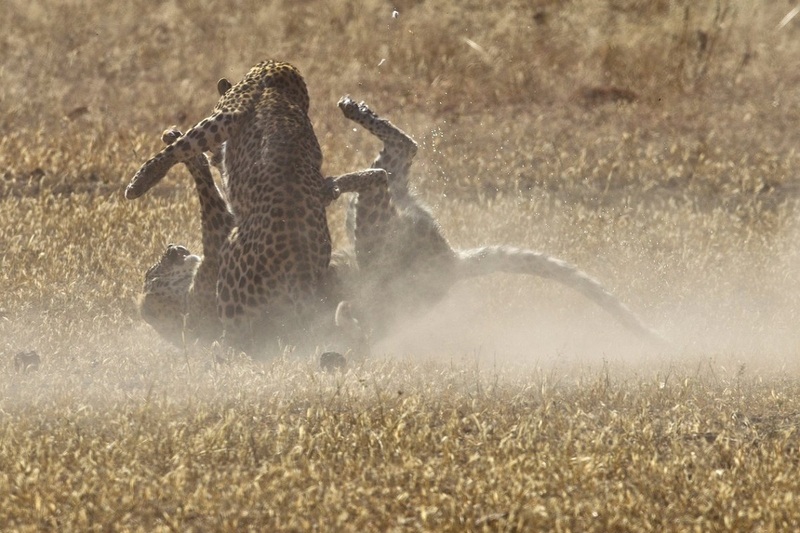 “They fought for a few seconds, then broke loose. 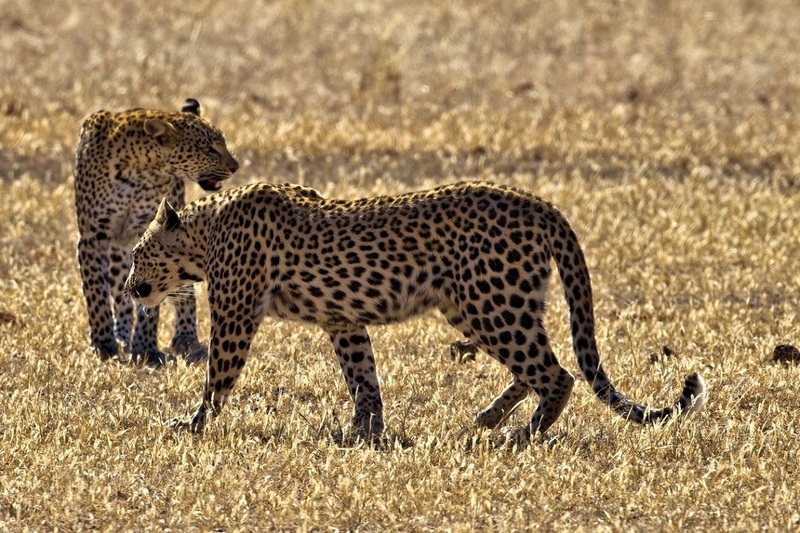 One began walking away – but the other wouldn’t let things be, and the fight continued with much growling and snarling. Soon round two was over as quickly as it had begun. 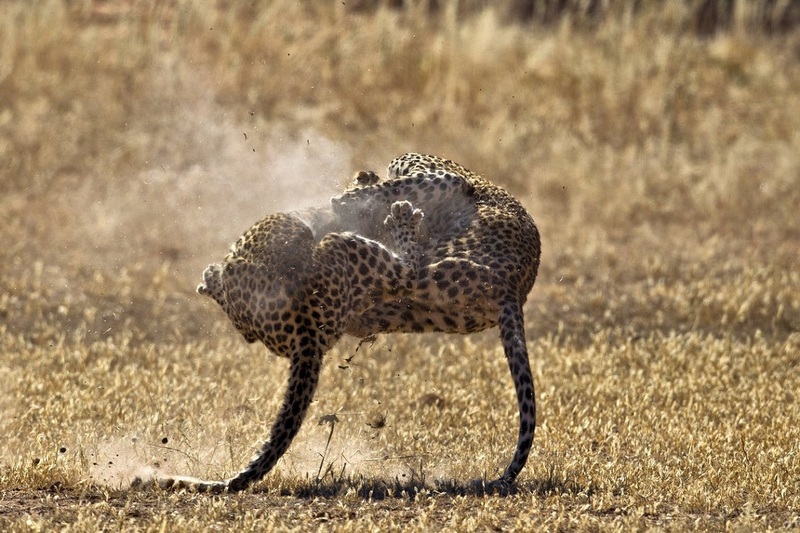 “At this stage one leopard was retreating and submitting to the stronger one. Then the fight started again. 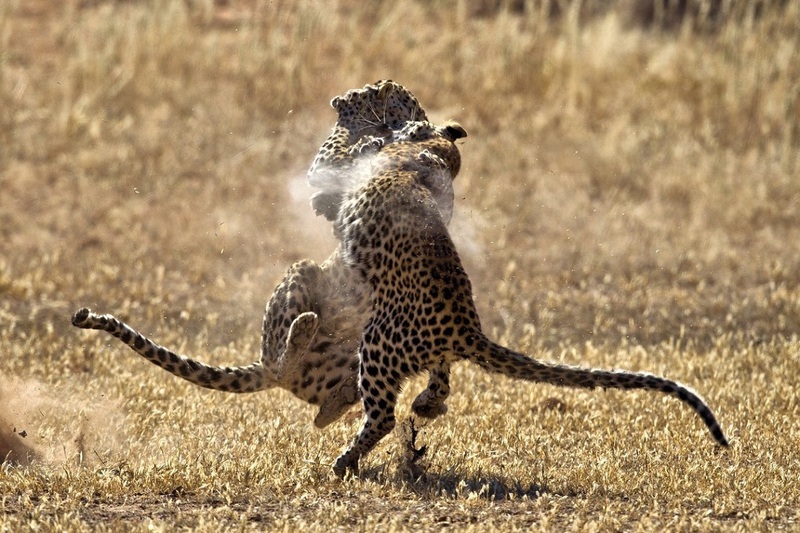 According to Dr Matthew Schurch of the Kgalagadi Leopard Project, the leopard on the right is known as Miera and the cat on the left is called Tsamma. 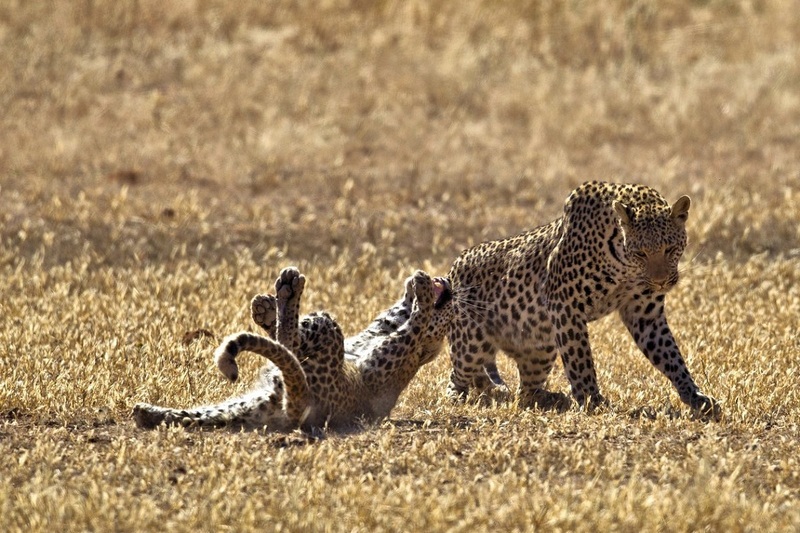 Both leopards were born in 2010. Miera was born to Khomani, a female whose territory centred around Montrose and Batulama but extended north to about Urikaruus. 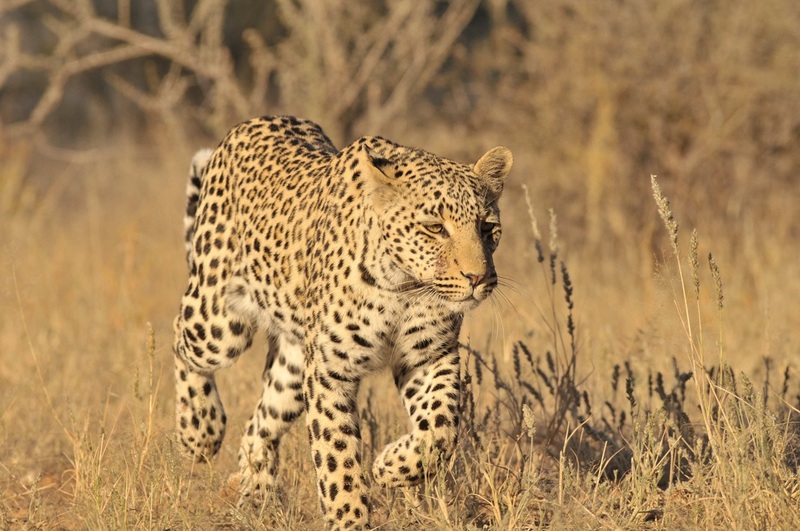 Tsamma was born to Barolong, a leopard with a much smaller river bed territory. Barolong was rarely seen far from Urikaruus, says Matthew. Matthew suspects Tsamma moved south and bumped into Miera in May 2012. “Judging by the images, Miera clearly has a more dominant pose, and following her throughout the fight sequence, she seems to generally be the more aggressive one. Tsamma, not really that much smaller, is much more submissive. I believe that a few fights probably took place over a couple of days as Miera was seen the following day (23 May) with no scars on her nose, and then I saw her on 27 May with quite a nasty little wound on the side of her nose (see below). 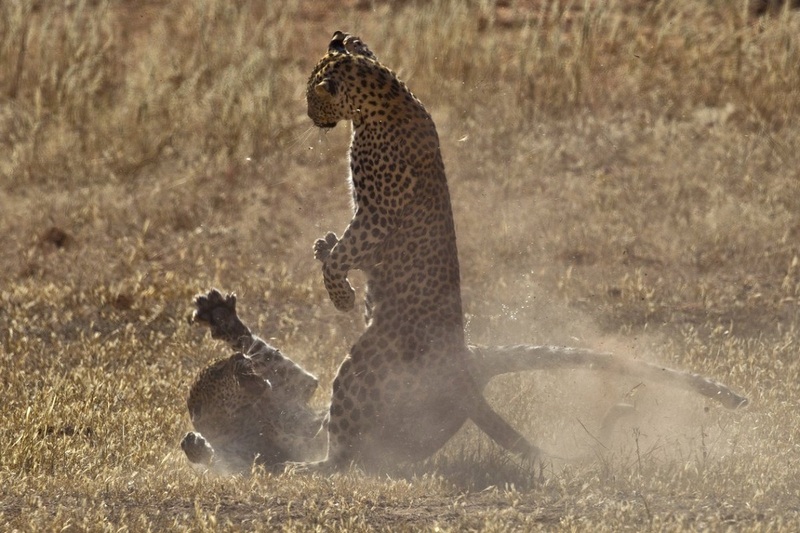 To learn more about the leopards of the Kgalagadi and how to tell them apart, visit the Kgalagadi Leopard Project or follow them on Facebook. Subscribe to the Wild newsletter below and stand a chance to win a Bushnell binocular! We renewed our Wildcard in October at the Karoo National Park. 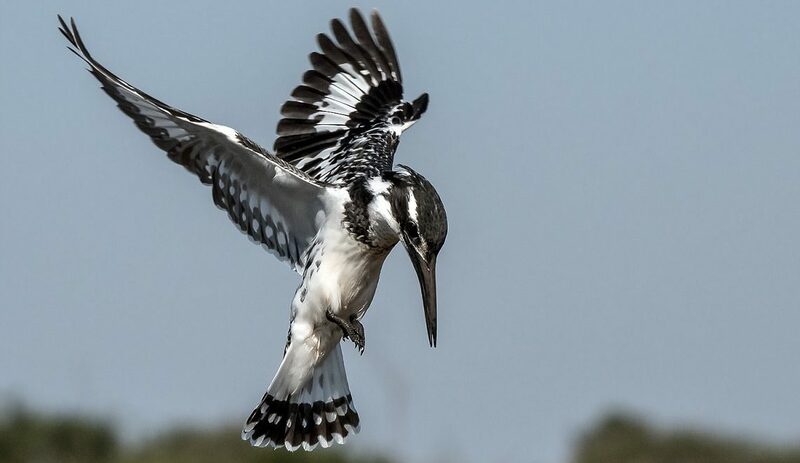 Sjoe baie dankie vir die pragtige fotos.Ons het ons het ons wildcard hernu by Mokala nas park ook n mooi psrk kan gerus besoek word.